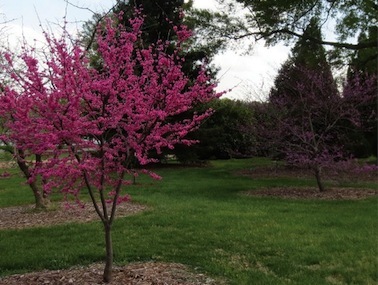 One of my favorite spring flowering trees is Cercis canadensis, Eastern Redbud. It is one of the earliest to begin blooming in the spring and it seems to flower forever! It is a hardy small tree being found in zones 4 to 9. In the wild it can reach a height of 20 to 25 feet but usually stays smaller in the urban landscape. It does best in moist, well drained soils but is fairly adaptable to different soil types. ‘Appalachian Red’ is a favorite among many cultivars of this native tree. Though not truly red, this cultivar exhibits stand out, flashy bright pink flowers in the spring before the leaves emerge. After a long bloom cycle the characteristic heart shaped leave emerge soft green. Fall color is minimal, usually yellow followed by decent winter branch texture and nice bark. A wonderful small flowering tree worthy of a try in your garden. Note: First published in the newsletter TREE TIPS, WINTER 2013 – TREE & SHRUB CARE FROM BARTLETT TREE EXPERTS. Reprinted here with permission.